After a long gap, I visited the “Stinky Pond”, located between the Carpentry Shed and the RV Dairy (just behind the BBT) some days ago. This used to be, despite the awful smell, one of the most tranquil spots on campus. Surrounded by greenery and being cool and moist all through the year, this spot had been a favorite of mine. The pond had water, surrounded by trees and shrubs and the stink that came not from the pond water (which is mainly water from the laundry) but from the adjacent pipes that carries bathwater from many of the hostels. I was not disappointed. 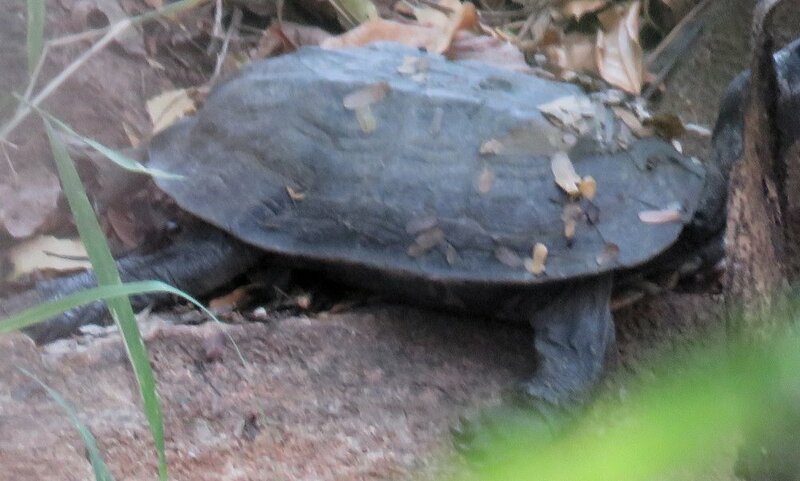 As I cautiously approached the pond, one by one, the tortoises that lived disappeared into the water with a loud plonk. Yet, I managed to see one of them – the Peninsular Black turtle for a couple of minutes before it decided to disappear into the waters. From the dense undergrowth adjacent to the waterbody came the loud raucous calls of the whitebreasted waterhen. A Pond heron sat meditatively on a low branch, while a pair of white-browed wagtails foraged in the slushy, wet mud at one end of the pond. As I watched, a sudden moment caught my eye and a myna-sized bird, greyish in colour came into view. It was a subspecies of the Indian Blackbird that was not actually black in its plumage! Slowly I moved across to the other side of the pond, hoping to capture an image of this uncommon visitor to our campus, a bird that is seen only in dense wooded, cool parts like the surrounds of the Stinky pond – a micro-habitat that is fast vanishing on our campus. I waited for about five minutes and there it was, posing perfectly for me on a leafless branch. I got a couple of good shots of the bird, a male. This area has a rich birdlife and I have seen six or seven species of flycatchers, orange-headed thrushes, Indian pitta, warblers, wagtails, the green sandpiper apart from the resident bulbuls and babblers. It is a pity that the greenery in this patch has gradually been reduced over the years. In the 1990's, this was a dense impenetrable jungle, but steadily, parts of this patch was cleared for vermicomposting, dumping of unused building materials, wastes like electric tubes, bike parking area, etc. etc. Currently there is just 40-50% of the original area under vegetation. 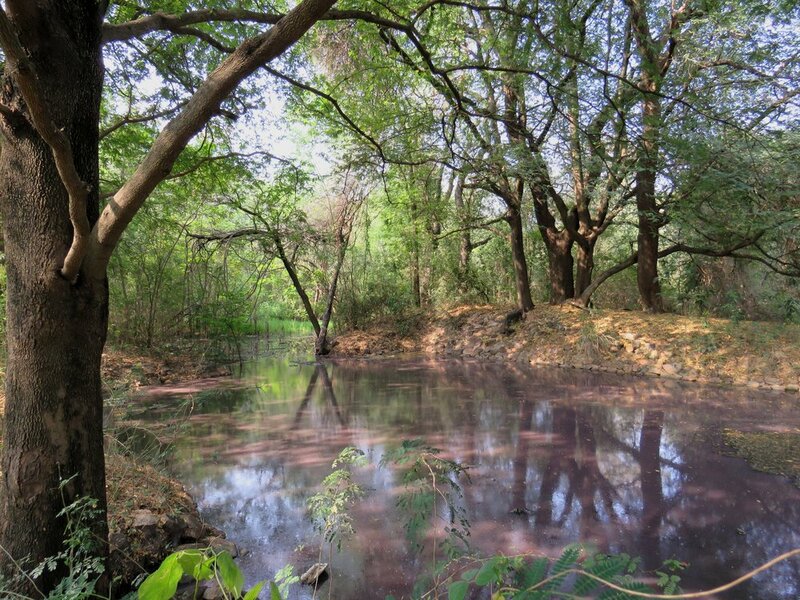 A few years ago, students had, as a part of their club activity, studied this area and suggested the filtering of water released from the laundry and to clean up the water in the pond. The stinking grey water from the bathrooms too need to be diverted to make the place stink-free. This is perhaps the only permanent waterbody on campus and it is an important micro-habitat to several wildlife species. Relocating the dumpyard and reclaiming the greenery in this patch will serve in supporting many of these species and help maintain the biological diversity of the Bird preserve.